So you have an amazing reed- should you save it forever to use as a model reed? Probably not. If you are playing a commercial reed then definitely not. Chances are what makes that particular reed great is the cane and not the shape of the vamp. If you have a great commercial reed, that is almost certainly the case and copying that reed won’t really matter anyways because believe it or not, the major reed brands are made on incredible machines and are extremely consistent in terms of measurements- so copying that particular reed wouldn’t be much better than copying any reed of that brand and model. What I do recommend strongly is to use a model reed with a vamp that is similar to the style of reed you like. So if you like “X” brand of reeds the best, start with a model that is similar to that. UHL Technik produces a number of plastic guides that serve as models for the RPM68. You can also use a reed as a model- but the plastic guides are much more consistent and durable. If you want to copy a rare vamp or create your own, UHL Technik also does custom guides. I’ve found something better and faster than sanding with a diamond stone. It’s 3M sandblaster sandpaper. This sandpaper is design for wood and it’s non clogging, which means it cuts fast and lasts a long time. I’ve been using 220 to flatten and 400 for finishing. My diamond stone? 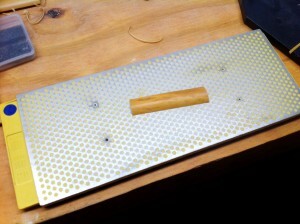 It’s a nice flat surface for me to sand on now…glass works too! The single most frustrating aspect of making reeds is sanding them flat after the gouging stage. One trick I’ve found is to sand before shaping so you have a larger base to work with and the cane doesn’t ‘rock’ too much creating and uneven surface. But the biggest problem has always been the sandpaper itself. Must be replaced and re glued/taped etc- it’s a pain! This is why I’ve finally purchased a DMT Diamond sharpening stone to use instead of sandpaper. It’s large enough(10×4 inches), has a coarse and extra coarse side(equivalent to 220 and 325 grit) and best of all- it’s flat and will always stay flat. So far it seems to be working quite well. I start on the extra coarse side and then finish on the coarse side. I’ve made five reeds with it, and I’m achieving flatter reeds faster. A few days ago I was given a tube of cane by a friend of mine. He told me that he’d only tell me what type of cane it was after I made a few reeds with it. I made a few reeds with the cane last night. It was from a good tube, very straight and fairly thick walled. The two reeds I made were both on the hard side, but had a good sound and response. I was impressed enough with the results that I gave him a call right away to find out more. As it turns out that tube was from a batch of cane used by Simeon Bellison….in the 1940s! Simeon Bellison the principle clarinetist of the New York Phil from 1920-1948…and apparently, a reed maker. There is often a lot of speculation as to whether the age of the reed affects the playing quality. Some players maintain that older is better, while others speculate that cane improves with age until a certain point(let’s say 10 years) and then declines. In my opinion this issue will probably never be settled, there are simply too many variables and subjective preferences to definitively say one way or the other. In this case, the origin of the cane is unknown, so it isn’t possible to compare it to more recent years(if in fact it is still being grown.) Cane from the same region can vary from year to year due to growing conditions. So even when you can directly compare aged and non aged cane from the same region, there may be other factors at play that affect the quality. Bellison’s cane certainly still makes good sounding reeds. If it was still being sold, I would buy a pound or two to experiment further, but I guess I’ll be sticking with RDG for the time being.